Item includes: – 2 one-piece style front bucket covers – 1 rear bench cover(2pcs: 1 backrest cover + 1 bottom bench cover) – 2 separate headrest covers – 1 bag of snaps. 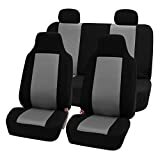 Total 6 pieces: 2 front seat covers, 2 rear seat covers, 2 separated headrest covers. Small fish net sandwich cloth + 3mm foam backing + mesh cloth finish.